Happy Father's Day everyone (Happy Father's Day Dad)! Today's recipe is inspired by "Daddy's Little Girl" (seriously, my daughter has my hubby wrapped around her little finger) and her favorite Disney character, Elsa from "Frozen." In my last post, I showed you how we made this blue smoothie, using homemade veggie dye. Then, I teased these blue green coconut-sprinkled cookies, using one to garnish this Colourful Coconut Funfetti Birthday Cake Batter Smoothie on Instagram for my hubby's birthday (this weekend is all about him). As I have been a bit busy the past few days, this was my first opportunity to blog about these cool mint cookies. To make them, I put 3/4 cup almond flour, 1/4 cup coconut flakes, 1 Tbsp. 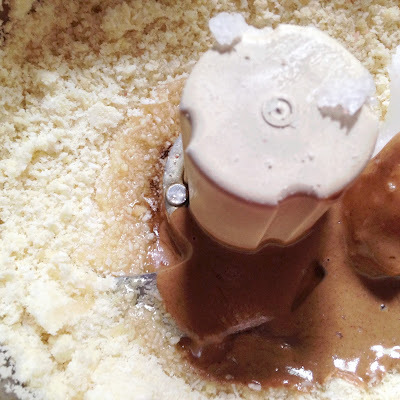 almond butter, 1 Tbsp. coconut oil, 1 Tbsp. maple syrup, a sprinkling of sea salt, some vanilla (it wouldn't be an "unbaked" good without it) and peppermint extract, to taste (mint always makes me think of something cool and refreshing) in a mini food processor. 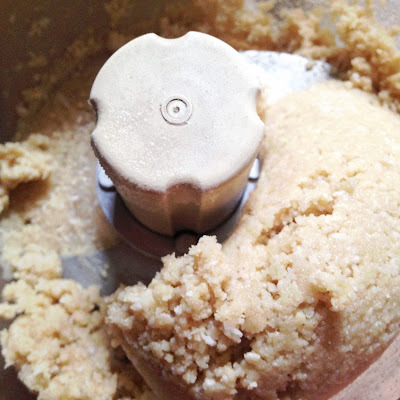 I gave all the ingredients a spin in my mini food processor until it looks like a dough. I poured out the crumbly dough onto a clean flat surface (I used a cutting board), as shown. Then, I molded the dough into a ball, before rolling it flat. Once the dough was the desired thickness, I cut out small cookie shapes. I selected little flowers, which are similar to snowflakes, but more appropriate for the season. I ended up with about 18-20 flower cookies, which I decorated with blue green (basically the official Elsa blue, in my opinion) coconut sprinkles (these were dyed with the natural veggie food coloring from my last post). I added some frosty dimension with some plain shredded coconut on top. Yum! These store well in your fridge or freezer for a refreshing treat on this hot summer days. Happy first day of summer! Hayden found a way to chill on this hot summer day, too. Check out her cucumber eye mask and fresh cucumber snack. For those of you who were hoping for another 100 Percent Pure post, don't worry; I'll be posting more about those new Eye Creamsticks, Vitamints and the Mattifying Primer this week. Stay tuned, and check out my previews and makeup swatches on Twitter at @ Rawdorable and Instagram (also @Rawdorable). Have you had a muffin batter smoothie yet? Who is that masked woman?